Chinese fried rice (simplified Chinese: 炒饭; traditional Chinese: 炒飯; pinyin: chǎofàn; Jyutping: caau2 faan6; Pe̍h-ōe-jī: chhá-pn̄g) is a family of fried rice dishes popular in sinophone countries and around the world. It is sometimes served as the penultimate dish in Chinese banquets, just before dessert. The earliest record of fried rice is found in the Sui dynasty (589–618 CE). Though the stir-frying technique used for fried rice was recorded much earlier period, it was only in the late Ming dynasty (1368–1644 CE) that the technique become widely popular. Fried rice is believed to have started as a way to accommodate leftovers. 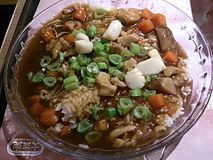 Traditionally, Southern Chinese prefer their rice polished and plain, as a base staple to eat with meat and vegetables. The vegetables, meat and rice leftovers from yesterday—which have passed their prime but are still good to consume, and too good to be fed to animals—are seasoned with soy sauce, lard and garlic, and stir-fried, making a hot meal. The basic elements of Chinese fried rice including rice, meat and vegetables, soy sauce and garlic. Numbers of fried rice recipes has been developed in China, such as Yangchow and Szechwan fried rice. Leftover cooked rice among the Cantonese is commonly made into fried rice, prepared with chopped vegetables and meat. It is believed[by whom?] that the basic stir-fried technique to cook fried rice, which required Chinese wok, has spread from Southern China to other rice farming cultures in East and Southeast Asia. The basic elements of Chinese fried rice are cooked rice—preferably leftovers from yesterday, meat and vegetables—possibly also leftovers, mixed with egg, soy sauce and garlic for flavour and seasoning, also cooking oil for greasing; either using lard, vegetable oil or sesame oil. The oil and soy sauce greased and coated the rice grains thus prevent them from burning and sticking to cooking vessel. Sometimes chopped scallion, ginger, chili pepper and mushroom, also diced processed pork are added into the mixture. All ingredients are stir-fried on a strong fire using Chinese wok cooking vessel, and the rice being turned, stirred and agitated using spatula to evenly cooked the rice and distribute the seasoning. The main ingredients of basic Chinese fried rice are cooked rice, stir-fried with chopped vegetables and meat, seasoned with soy sauce and garlic. Started as a humble and simple way to cook leftovers, initially there is no single exact recipe of fried rice in Chinese cuisine tradition, since any different leftovers and additional ingredients could led to another different recipe of fried rice. Each households might have their own way in cooking fried rice, which might led to myriad variants. Varieties differs in its contents, seasonings, spices, also vegetables and meat being used. This versatility and its economic value to save food has led to the popularity of stir-fried rice in China. Today, many recipes of Chinese fried rice exist. This includes regional varieties such as Yangzhou fried rice (扬州炒饭; Yángzhōu chǎofàn) from Yangzhou, Hokkien fried rice (Chinese: 福建炒飯; Fuk1gin3 caau2faan6) from Hong Kong, and spicy Szechwan fried rice from Sichuan. Szechwan fried rice is notable for its tangy, hot and spicy flavour owed to doubanjiang chili sauce mixed with garlic, green and red onion. Chinese fried rice dishes also spread to other parts of the world. The stir-fried technique that requires the use of Chinese wok, also the use of soy sauce as a seasoning in fried rice, clearly demonstrate Chinese cuisine influence. These cooking elements has spread to neighboring East Asian countries, the Southeast Asian region, and subsequently, the rest of the world. For example, Japanese chāhan (チャーハン; 炒飯) originated from the fried rice made by Chinese immigrants in the 19th century. Despite having distinctly stronger flavour, Indonesian nasi goreng is also believed initially was influenced by Chinese fried rice. Latin American countries also have their versions of Chinese fried rice since long ago, such as arroz chaufa (Peruvian-Chinese fried rice) and arroz frito (Cuban-Chinese fried rice). Indian pulao is also influenced by Chinese fried rice. Chop suey served on top of fried rice, served in a Chinese restaurant in the United States. Chinese fried rice is often a common staple in American Chinese cuisine, especially in the form sold as fast food. The most common form of American Chinese fried rice consists of some mixture of eggs, scallions, and vegetables, with chopped meat added at the customer's discretion, and usually flavored with soy sauce instead of table salt (more typical for Chinese-style fried rice). Fried rice made in American Chinese restaurants can vary in appearance, from a dark brown appearance often seen in East Coast establishments, to a light brown appearance often seen in Midwestern American Chinese restaurants. Sometimes chop suey-fried rice combo is offered in Chinese restaurant in the United States. The dish is also a staple of Chinese restaurants in the United Kingdom (both "sit-in" and "takeaway"), and is very popular in the West African nations of Nigeria, Ghana and Togo, both as restaurant and as street food. In Korea, the Korean Chinese-style fried rice is a separate genre of fried rice that differs from Korean-style fried rice dishes. McDonald's serves McChao, a Chinese fried rice dish named after chǎofàn, which means "fried rice" in Chinese. Bacillus cereus poisoning is called "Chinese fried rice syndrome" due to its historical tie with the fried rice dishes. ^ "Chinese Fried Rice". iFood.tv. ^ Grace Young (2010). Stir-Frying to the Sky's Edge: The Ultimate Guide to Mastery, with Authentic Recipes and Stories. Simon and Schuster. p. 49. ISBN 9781416580577. ^ a b Frederick J. Simoons (1990). Food in China: A Cultural and Historical Inquiry. CRC Press. ISBN 9780849388040. ^ a b "Great Leftovers, The Humble Origin of Fried Rice". Cultural China. ^ "Chinese Fried Rice". Food.com. ^ "Szechuan Fried Rice". China Sichuan Food. 16 November 2014. ^ Ono, Tadashi; Salat, Harris (2013). Japanese Soul Cooking: Ramen, Tonkatsu, Tempura, and More from the Streets and Kitchens of Tokyo and Beyond. Berkeley, CA: Ten Speed Press. pp. 397–398. ISBN 978-1-60774-353-8. ^ Mutia Silviani Aflakhah (9 February 2017). "Akulturasi Budaya di Balik Makanan Nusantara". Good News from Indonesia (in Indonesian). ^ Janer, Zilkia (2008). Albala, Ken (ed.). Latino Food Culture. Westport, CT: Greenwood Press. p. 30. ISBN 9780313340277. ^ Gold, Jonathan (8 June 2016). "Jonathan Gold returns to Pico Boulevard and finds a great hangover cure". Los Angeles Times. Retrieved 4 March 2017. ^ Nandy, Ashis (2004). "The Changing Popular Culture of Indian Food: Preliminary Notes". South Asia Research. 24 (1): 9–19. doi:10.1177/0262728004042760. ISSN 0262-7280. Indian pulao is not the same as Persian pilaf and, though in recent years it has been influenced by Chinese fried rice, it is not fried rice either. ^ "Dark Fried Rice - Recipe Detail - BakeSpace.com". Retrieved 8 December 2014. ^ Delaney, Carol; Kaspin, Deborah (2017). Investigating Culture: An Experiential Introduction to Anthropology (third ed.). Hoboken, NJ: John Wiley & Sons. p. 268. ISBN 9781405154246. ^ Cahill, John D.; Durgin, Scott (2003). "Food Poisoning". In Cahill, John D. (ed.). Updates in Emergency Medicine. New York: Springer Science+Business Media. p. 94. doi:10.1007/978-1-4615-0155-8. ISBN 9780306474705. Bacillus cereus poisoning has historically been associated with fried rice, being referred to as the "Chinese fried rice syndrome".